An epic fantasy quest to recover an ancient magic scepter from a tyrant king in his Dark Tower, brought to life in electronic form. To vanquish the usurper, players search the four realms of the circular game board for three keys to unlock the tower's gate. On this journey, there are battles to be fought against roving bands of brigands, dragons, plague and hunger. There are bazaars to visit to purchase supplies and assistants for the quest. There are uncharted territories to get lost in and tombs and ruins to plunder. And there is a mighty army to be raised before the player can lay seige to the tower and fight either to glorious victory or crushing defeat. 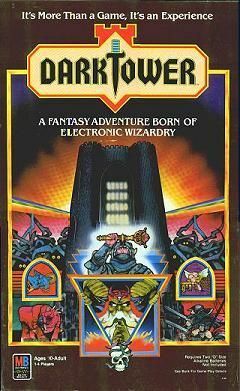 Dated and primitive by today's standards, Dark Tower was nevertheless an astonishing achievement when it was released in 1981. Every aspect of the game was monitored by a small computer inside the black plastic shell of the tower itself, an unheard of innovation at the time. Players input their moves on a small membrane keypad each turn and the computer took over from there, doing everything from conducting the progress of battles to keeping track of how much (or little) food was left to feed the players' always hungry warriors. It could even play recognizable pieces of music at significant points during the game.